Discover the perfect way to plan your Walt Disney World® vacation both easily and affordably. Your Travel Agent can book the perfect Walt Disney World vacation that fits your family, taste and budget. Upon arriving, all there is for you to do is have fun! 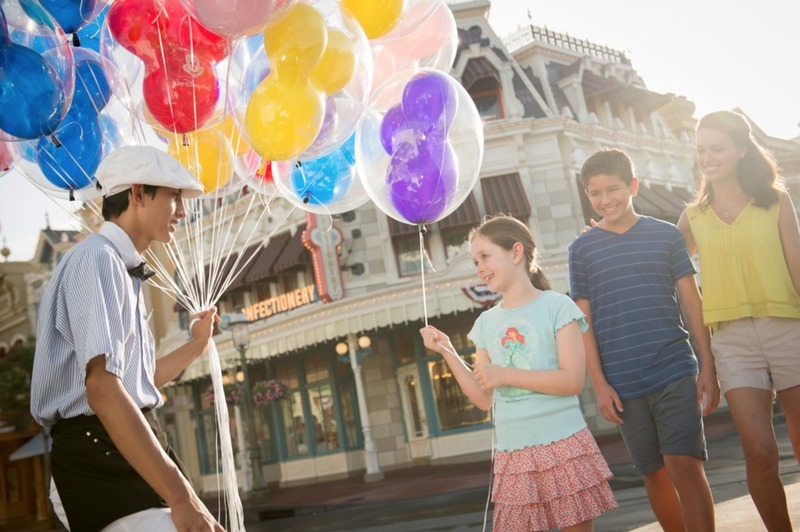 Make the most of your 2019 Walt Disney World® vacation package with Walt Disney Travel Company Magical Extras - a variety of discounts and offerings on dining, entertainment, shopping and more. Base Ticket with choice of ticket length from 2 to 10 days. For each day of your ticket, you'll enjoy admission to Magic Kingdom® Park, Epcot®, Disney's Hollywood Studios® or Disney's Animal Kingdom® Theme Park (one Theme Park per day). Keepsake Luggage Tag (one per person). Everyone in the room must be on the same package and ticket options. Package and package components are nontransferable. Does not include activities/events separately priced. Multi-day tickets and options expire 14 days from date of first use. First use must be by December 31, 2019. Access to reserve some Disney FastPass+ attractions, shows and more—up to 60 days prior to arrival. Complimentary motor coach transportation from Orlando International Airport to your Disney Resort hotel and throughout Walt Disney World® Resort. Guests will have several new beverage options available in 2019 when they purchase one of the 2019 Disney Dining Plans along with their Walt Disney World vacation package. Guests under 21 years of age will be able to choose one non-alcoholic beverage (including specialty beverages where offered). Guests 21 and older will be able to choose either one non-alcoholic beverage (including specialty beverages where offered) or one single-serving mixed cocktail, beer, or wine (where offered) within their meal entitlement. Add Dining to this Package! The following exclusive Magical Extras are included with Walt Disney Travel Company packages at the Walt Disney World® Resort. Miniature Golf: Choose from two 18-hole miniature golf adventures: one based on a classic Disney animated film, and one that lets you join Santa and his elves at their off-season retreat. Receive 4 vouchers per package, each voucher valid for one (1) 18-hole round of miniature golf prior to 4:00 PM on one (1) day for ONE (1) Guest at either Disney's Fantasia Gardens Miniature Golf Course or Disney's Winter Summerland Miniature Golf Course. Voucher and Magical Extras Savings Card are required at time of redemption. Voucher is non-transferable and expires at midnight on the day of checkout. Lost or stolen vouchers will not be replaced. Not valid with any other offer, discount, or promotions, and may not be redeemed for cash in whole or in part. Due to capacity limitations, occasionally it may not be possible to accommodate Guests at the time they choose to visit. No photocopy or reproductions of voucher will be accepted. VOUCHER IS VOID IF SOLD. ESPN Wide World of Sports Complex: You get to check out the ESPN Wide World of Sports Complex which is a professionally run, state-of-the-art facility which hosts sporting events for athletes of all ages and abilities. Receive 4 vouchers per package, each voucher valid for one (1) general admission to ESPN Wide World of Sports Complex on one (1) day for ONE (1) Guest. Valid only on event days. Some events require an additional admission charge. There are no events on certain days. Days and hours of operation of concessions, venues and attractions vary. Visit www.espnwwos.com for more information. Voucher and Magical Extras Savings Card are required at time of redemption. Voucher is non-transferable and expires at midnight on the day of checkout. Lost or stolen vouchers will not be replaced. Not valid with any other offer, discount, or promotions, and may not be redeemed for cash in whole or in part. No photocopy or reproductions of voucher will be accepted. VOUCHER IS VOID IF SOLD. Receive 10% off the non-discounted price of all activities, including parasailing, waterskiing, wakeboarding, tubing trips and personal watercraft rentals at Sammy Duvall's Water Sports Centre at Disney's Contemporary Resort. Restrictions apply. Excludes merchandise. Subject to availability. For reservations call (407) 939-0754. Guests younger than age 18 must have parent or guardian permission to call. Due to capacity limitations, occasionally it may not be possible to accommodate Guests at the time they choose to visit. Splitsville Luxury Lanes™: Enjoy an upscale new spin on a classic American pastime at this modern take on a bowling alley. Receive 10% off the non-discounted price of bowling (walk-in only); receive 10% off the purchase of food and non-alcoholic beverages (dine-in only); and receive 10% off the non-discounted price of merchandise at Splitsville Luxury Lanes™ at Disney Springs® West Side. Earl of Sandwich®: Home of the World’s Greatest Hot Sandwich, featuring a wide variety of sandwiches on fresh-baked artisan bread, hand-tossed salads and hand crafted wraps. Receive a 10% discount on the purchase of food and non-alcoholic beverages at Earl of Sandwich at Disney Springs® Marketplace. Valid for dine-in only. Gratuity not included. Ghirardelli Ice® Cream and Chocolate Shop: The world-famous chocolatier delivers decadent sundaes smothered with hot, house-made fudge as well as chocolate treats and drinks. Receive 10% off any Chocolate purchase or $1 off any Specialty Sundae at Ghirardelli® Ice Cream and Chocolate Shop at Disney Springs® Marketplace. Cannot be combined with any other offers. House of Blues® Restaurant & Bar: Savor Southern classics and folk art at this eclectic stop. Receive 20% discount on the purchase of food at House of Blues® Restaurant and Bar located in Disney Springs® West Side. Excludes alcoholic beverages, tax, gratuity and smokehouse. Joffrey’s Coffee and Tea Company®: Joffrey's is the official specialty coffee of Walt Disney World® Resort, Disneyland® Resort and Disney Vacation Club®. Enjoy a range of specialty coffees, teas, smoothies, assorted fresh pastries, and bottled drinks. Receive 20% off your entire purchase excluding alcohol at Joffrey’s Coffee and Tea Company at the following locations at Walt Disney World® Resort: Magic Kingdom® Park, Epcot®, Disney's Animal Kingdom Theme® Park, Disney's Hollywood Studios®, Disney's Blizzard Beach® Water Park, Disney’s Typhoon Lagoon® Water Park and Disney Springs® The Landing including Tea Traders Café by Joffrey's. Or purchase online at Joffreys.com and use coupon code: travel. Planet Hollywood Observatory™: Enter a realm of innovative cuisine and rare Hollywood memorabilia. Receive a 10% discount on the purchase of food and non-alcoholic beverages during lunch or dinner at Planet Hollywood at Disney Springs® Marketplace. Valid for dine-in only. Gratuity not included. Offer not valid for merchandise. Wolfgang Puck® Express: Get a gourmet start to the day with unique breakfast plates, artisan lunch and dinner specials, as well as an exciting kids menu. Receive a 10% discount on the purchase of food and non-alcoholic beverages during breakfast, lunch or dinner at Wolfgang Puck® Express at Disney Springs® Marketplace. Offer not valid for merchandise. Basin: Breathe as you browse the enchanting aromatherapy of this all-natural bath, body and hair care emporium. Receive 10% off your entire purchase (excluding sale items) at Basin at Disney Springs® Marketplace or Basin White in Disney’s Grand Floridian Resort and Spa. Crystal Arts by Arribas Brothers: Remember your visit with porcelain giftware, lead crystal glassware and Pavé crystal in Disney characters and themes. Receive 10% off purchases at the Crystal Arts by Arribas Brothers stores at Disney Springs® Marketplace, Magic Kingdom® Park and Epcot®. Exclusions apply. Not applicable to shipping charges. Some other restrictions apply. Discount may not be combined with any other offer. Curl® by Sammy Duvall: Dive into the beach lifestyle with Orlando’s premier store for all things surf and women’s fashion. Receive 10% off the non-discounted price of merchandise at Curl by Sammy Duvall at Disney Springs® West Side, excluding sale items. Edward Beiner Purveyor of Fine Eyewear: Peruse an unmatched collection of prescription eyeglasses and shades at this luxury specs shop, where personalized service is paramount. Receive 15% discount on any purchase at Edward Beiner Purveyor of Fine Eyewear located at Disney Springs® Town Center. Cannot be combined with any other offers. Filthy Rich: Elevate your ensemble with celebrity-inspired jewelry and accessories. This booth features replicas of memorable pieces worn by trendsetting stars and legendary icons from past and present. Receive 10% off the non-discounted price of merchandise at Filthy Rich located at Disney Springs® The Landing. Live Trends: The concept of artistically blending natural beauty, fashionable design, and simple living. Receive 10% off the non-discounted price of merchandise purchased at Live Trends at Disney Springs® Marketplace. Pop Gallery: Discover a modern art mecca brimming with unusual pieces ranging from abstract wall sculptures to vibrant giclée prints. Receive 10% off the non-discounted price of merchandise at Pop Gallery at Disney Springs® West Side. Published artists excluded. Not valid toward shipping. Other exclusions may apply. Something Silver®: Browse an ever-changing collection of on-trend sterling silver jewelry and accessories alongside timeless, everyday basics. Receive 10% off the non-discounted price of merchandise at Something Silver® at Disney Springs® West Side. Sublime Gifts and Finds: Discover unique gifts and finds like soy wax candles, handmade journals and inspirational books. Receive 10% off the non-discounted price of merchandise at Sublime Gifts and Finds at Disney Springs® The Landing. Sugarboo & Co: This family-owned shop is filled with whimsical treasures, including handmade jewelry, charming decor, uplifting art prints and delightful toys. Receive 10% off the non-discounted price of merchandise at Sugarboo & Co. located at Disney Springs® Town Center. Cannot be combined with any other offers. UGG: Brace yourself for a line of footwear so comfortable, it feels like nothing else. Receive customization up to $35 with any merchandise purchase at UGG at Disney Springs® Town Center. Exclusions may apply. Volcom: Journey to this niche boutique for cool clothing and gear to meet your skateboarding, snowboarding and surfing style needs. Receive 15% off the non-discounted price of merchandise at Volcom® located at Disney Springs® Town Center. Benefits are valid for arrivals January 1, 2019 – December 31, 2019. A valid Magical Extras Savings Card must be presented to receive any Magical Extras benefit. You must also present a valid voucher for admission to ESPN Wide World of Sports Complex and Disney’s Fantasia Gardens Miniature Golf Course or Disney’s Winter Summerland Miniature Golf Course. Benefits are valid during your Walt Disney Travel Company package stay. Benefits have no cash value, are nontransferable and void if transferred or sold. All benefits, services and locations are subject to change without notice. May not be combined with any other offer, discount or promotion. Valid for the number of Guests in the package, unless otherwise specified. All dining discounts exclude applicable tax and gratuities. Other restrictions and exclusions may apply. For dining reservations call (407) WDW-DINE or (407) 939-3463, or visit www.disneyworld.com/dining. Everyone in the room must be on the same package and ticket options. All passes must be used within 14 days of first use. Visiting more than one Theme Park on the same day requires the Park Hopper Option. Benefits are valid for arrivals January 1, 2019-December 31, 2019. A MagicBand or room key card must be presented at participating locations. 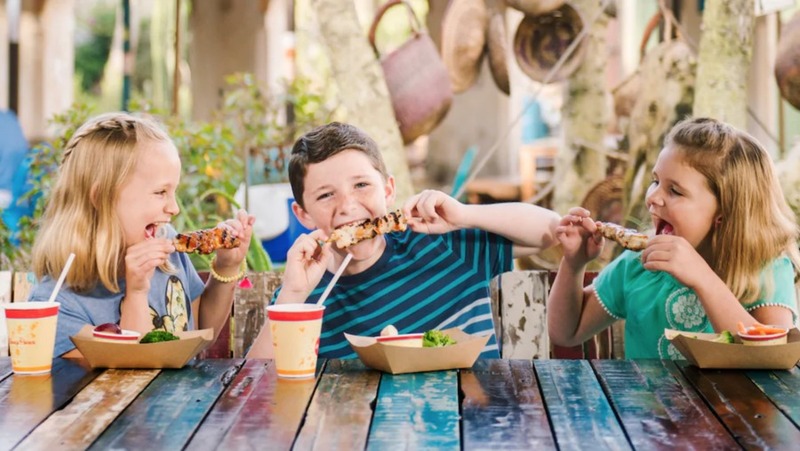 The Disney Resort Hotel Package Plus Quick-Service Dining is especially convenient for families who want the freedom to dine without having to make advance reservations. Base Ticket with choice of ticket length from 2 to 10 days. For each day of your ticket, you'll enjoy admission to Magic Kingdom® Park, Epcot®, Disney's Hollywood Studios® or Disney's Animal Kingdom® Theme Park (one Theme Park per day). Visiting more than one Theme Park on the same day requires the Park Hopper Option. Eligible for refills at self-service beverage islands at Quick-Service locations at any Disney Resort hotel. *Choose from a wide array of restaurants located in the Theme Parks, Water Parks, Disney Springs® area and Disney Resort hotels. Children 3-9 must choose from a children’s menu where available. **Guests must be age 21 and over and present valid ID to be served alcoholic beverages. Alcoholic beverages may only be redeemed with a Quick-Service meal entitlement. ***Guests have several new beverage options available including non-alcoholic specialty beverages and, for guests 21 and older, beer, wine and cocktails. Guests must present valid ID to be served alcoholic beverages. Alcoholic beverages may only be redeemed with a Quick-Service meal entitlement. Packages and package components (including dining entitlements) are nontransferable. Dining entitlements expire at midnight on the day of check-out. Children ages 3 – 9 must choose from a children's menu, where available. 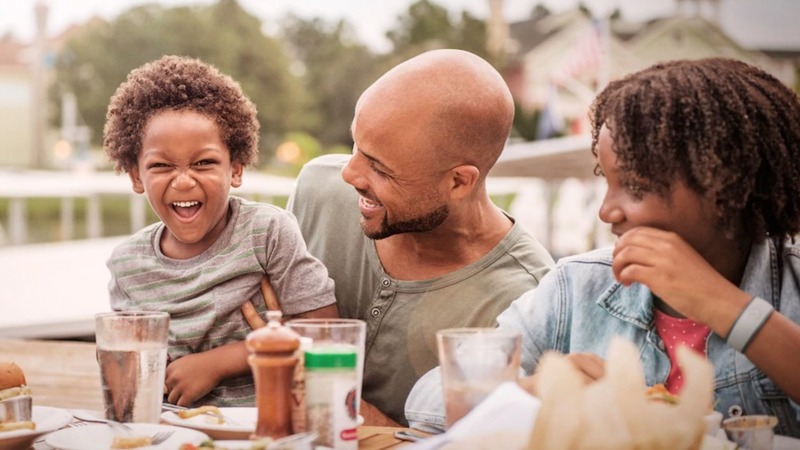 The Disney Resort Hotel Package Plus Dining offers a convenient way to plan out your food expenses and treat your family to a wide variety of dining experiences. Dine with some of your favorite Disney Characters! Character Dining Experiences add a little extra magic to your Table-Service meal with "up-close and personal" fun and photos with some of your favorite pals. Make sure to have your camera ready! Signature Dining restaurants offer an elegant Table-Service option featuring chefs creating enduring classics and innovative taste sensations that make each meal a gourmet event. Enjoy a fabulous, family-style dinner with live musical fun in Disney's Spirit of Aloha Dinner Show, or with the Wild West comedy of the Hoop-Dee-Doo Musical Revue. Table-Service restaurants, Character Dining and Dinner Shows book quickly, and some may have limited or no availability at the time of package purchase or when making dining reservations. To make reservations up to 180 days in advance, visit DisneyWorld.com/dining or call 407-WDW-DINE (939-3463). An accepted major credit card guarantee is required for dining reservations. Dining reservations must be canceled at least one (1) day before date of reservation or a cancellation charge may be incurred (charge varies by location). *Choose from a wide array of restaurants located in the Theme Parks, Water Parks, Disney Springs® area and Disney Resort hotels. Children 3-9 must choose from a children's menu where available. Gratuities are not included at Table-Service locations, except at Cinderella's Royal Table and all Dinner Shows and private (in-room) dining. Selecting a separate prix fixe menu offered at certain locations, requires payment of a surcharge in addition to redeeming the number of Table-Service entitlements required at the location. **Guests must be age 21 and over and present valid ID to be served alcoholic beverages. Alcoholic beverages may only be redeemed with a Quick-Service or Table-Service meal entitlement. †If available; buffet excludes Specialty Beverages that are sold separately. ***Guests have several new beverage options available including non-alcoholic specialty beverages and, for guests 21 and older, beer, wine and cocktails. Guests must present valid ID to be served alcoholic beverages. Alcoholic beverages may only be redeemed with a meal entitlement. Applicable gratuity charge not included except at participating prepaid dining locations, excludes alcoholic beverages, certain other limitations may apply, children ages 3-9 must choose from the children's menu if available. Meal plans must be purchased for the entire length of your stay and for your entire party. 1 Table-Service meal per person may be exchanged for 1 Character Dining Experience (Cinderella's Royal Table will require 2 Table-Service meals). 2 Table-Service meals per person may be exchanged for one of the following: 1 Signature Dining Experience; 1 Disney Dinner Show (category 2 or 3 seating; category 1 at 9:30 pm show); 1 Cinderella's Royal Table Experience; or 1 In-Room Private Dining meal. Choosing items from a separate prix fixe menu offered at certain locations requires payment of a surcharge in addition to redeeming the number of table service entitlements required at the location. Packages and package components (including dining entitlements) are nontransferable. Dining entitlements expire at midnight on the day of check-out. 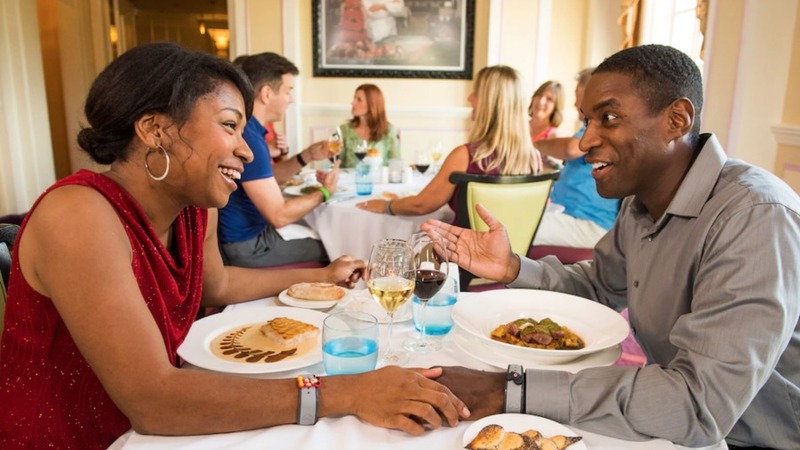 The Disney Resort Hotel Package Plus Deluxe Dining offers a wide variety of dining experiences with more flexibility and choices. *Choose from a wide array of restaurants located in the Theme Parks, Water Parks, Disney Springs® area and Disney Resort hotels. Guests ages 3 to 9 must order from a children’s menu, where available. Gratuities are not included at Table-Service locations, except at Cinderella’s Royal Table and all Dinner Shows and private (in-room) dining. Selecting a separate prix fixe menu offered at certain locations, requires payment of a surcharge in addition to redeeming the number of Table-Service entitlements required at the location.